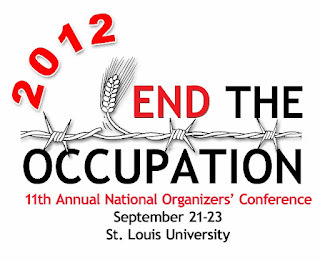 Blog to End the Occupation: Join Us in St. Louis 9/21-9/23 for National Organizers' Conference! 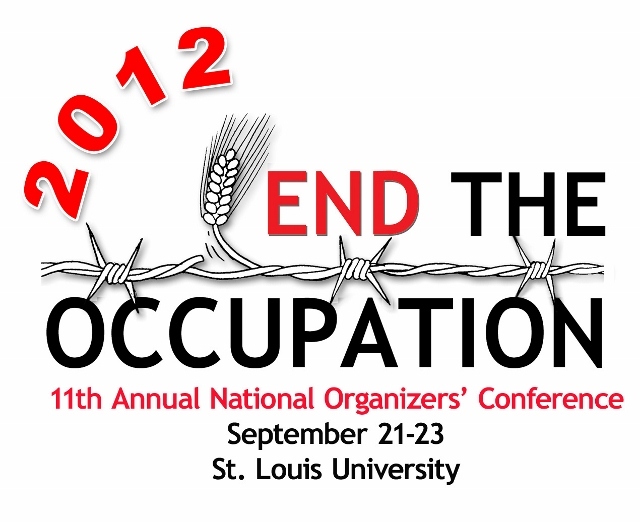 Join Us in St. Louis 9/21-9/23 for National Organizers' Conference! Planning is underway for our 11th Annual National Organizers' Conference and we want to make sure you are getting updates as soon as we have them so you can register to join us September 21-23 at St. Louis University! We will kick off our conference with a Friday night discussion on the Arab uprisings and how changes in the region affect our work to change U.S. policy toward Palestine/Israel. The speakers will be Dr. Hatem Bazian, Chairman of American Muslims for Palestine, and Phyllis Bennis, Director of the New Internationalism Project at the Institute for Policy Studies. Our Saturday night program features a performance by Palestinian-American poet and activist Remi Kanazi. Topics and workshops during the weekend will include next steps for church divestment efforts; building on recent BDS victories; campus activism; academic and cultural boycott initiatives; organizing and coalition building; and member group workshops. It's been a busy past few weeks for the US Campaign and our member groups. The United Methodist Church and Presbyterian Church both passed resolutions calling for a boycott of all products made in Israeli settlements in the occupied territories. TIAA-CREF's decision to remove Caterpillar from its Social Choice Funds portfolio was a big victory for the We Divest Campaign. With the help of Jewish Voice for Peace, St. Louis Palestine Solidarity Committee, and American Muslims for Palestine, we delivered more than 17,000 signatures to the State Department protesting U.S. and Israeli discriminatory policies. Register today to help continue our efforts to change U.S. policy to support human rights, international law, and equality. Make sure you book your hotel room by August 21 to be guaranteed a special conference rate. Also invite your friends on Facebook and your followers on Twitter using #ETO2012. We look forward to having you join us in St. Louis September 21-23!